Millions of people work in Slack channels each day. But as the number of channels within your organization grows into the hundreds or even thousands, finding the right one becomes more challenging. While clear naming conventions help with channel organization, it can be tough to discover relevant public channels you’re not yet a part of, especially if you don’t know the exact channel name. 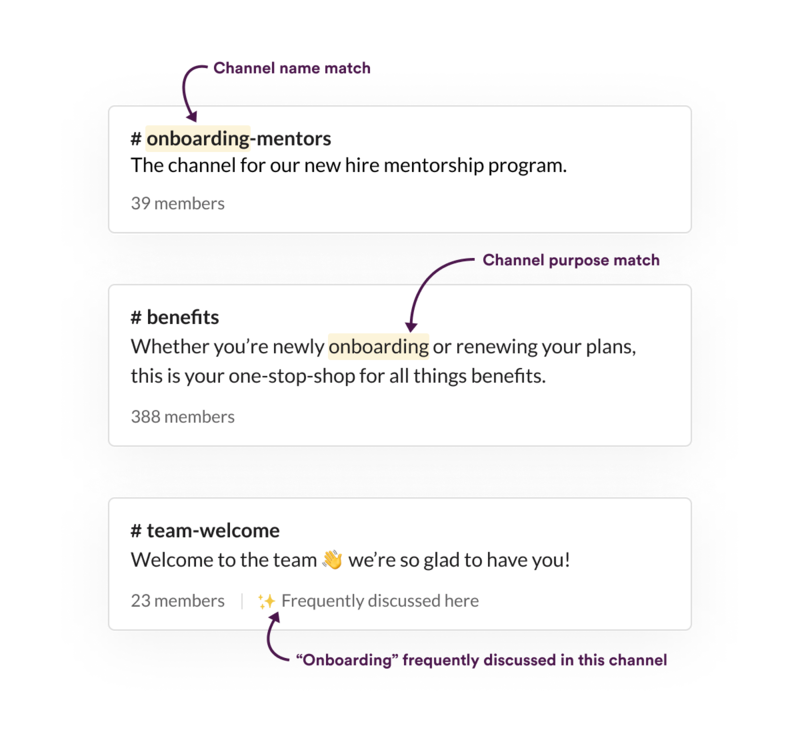 Starting today, searches in Slack will help you find not only key conversations and files but also the channels where that information lives. Searching for channels is no different than how you search in Slack now. Simply type the terms you’re looking for into the search bar, and fire away. In addition to the “Messages” and “Files” tabs that already exist in the results, you’ll see a new tab named “Channels.” There you’ll find the public channels—along with the private channels you belong to—that are most relevant to your search. To further refine your search, you can filter and sort the results by channel type (public, private or archived) or workspace. And with one click, you can preview or join the channels that interest you. A search isn’t just matching for the channel name but now accounts for other helpful cues, including the channel purpose and frequently discussed topics. It also considers relevance to you and those you work most closely with, improving the chances that you’ll find the right channel. So whether you’re a new employee looking for channels to get up to speed on your work or you just want to check if a channel already exists before creating one, these improvements to search can offer some assurance that you’re in the places—that is, the channels—you need to be. Channel search is rolling out over the next several days to desktop users. Have feedback? We’d love to hear it! You can drop us a line or reach us at @SlackHQ on Twitter.